Hi friends! I’m almost embarrassed to be using this photo because one of my two mums is halfway dead #notgoodwithplants. BUT it still screams fall and who doesn’t love a little fall inspiration on their Friday morning!? Also, it’s real life and lets face it, ya can’t be good at everything…. 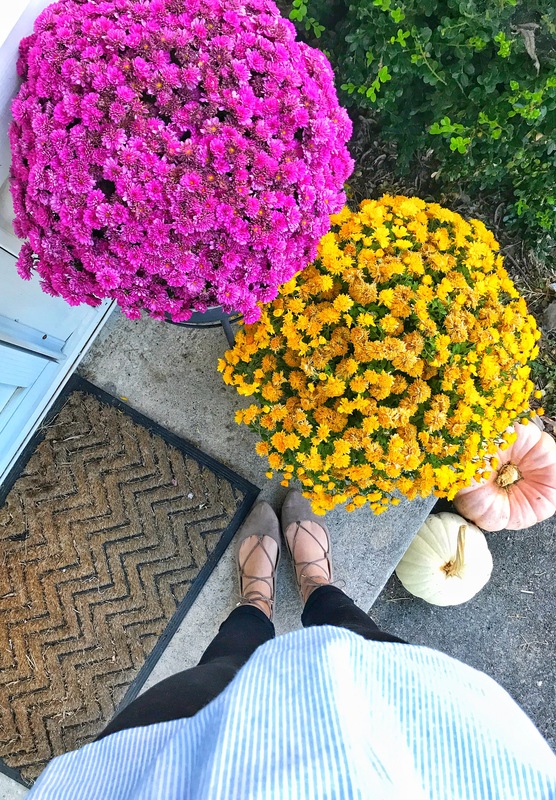 I’ve come to terms with the fact that I don’t have a green thumb (I’ve only had these mums for two weeks)!! Now, pumpkins require no maintenance, so those I can deal with.. haha!! For the past couple of years, I’ve been obsessed with lace up flats. I think the lace up feature is so chic and feminine and just gives off that extra pop of style!! I got the ones I’m wearing here, last year and they’re still going strong. I’m going to link up some additional pairs that I’m in love with. Flats are so easy to throw on and they go with ANYTHING, so sign me up! Nine times out of ten I’m going to pick a flat over a heel, because a.) I’m tall and b.) comfort.